I’m in the thick of it. That’s what I realized last night as I stood at my computer. I’m trying to do the standing desk thing because I work from home. I work from home now. Did I tell you? Well, I do. And sometimes I watch Netflix on my computer at my standup desk after work because I work at home. 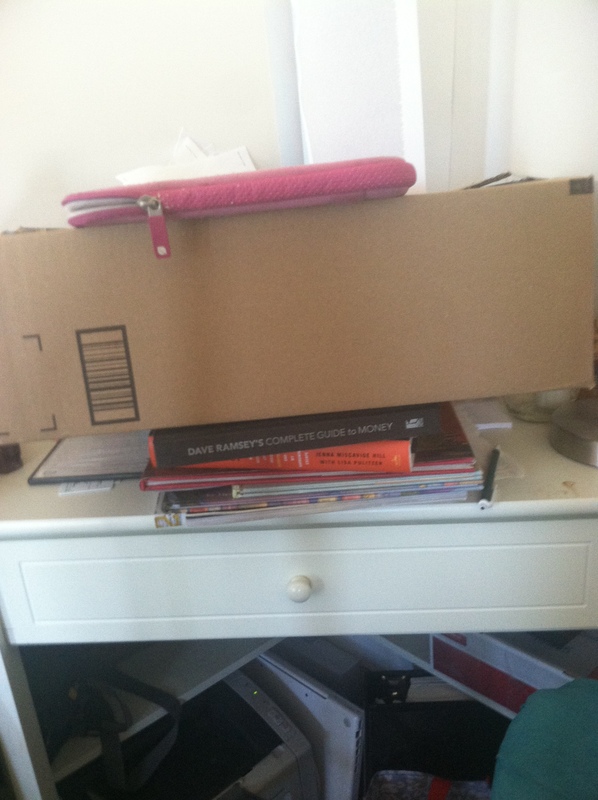 In case that wasn’t as confusing as possible, my standup desk is actually a normal desk with a pile of books and a cardboard box on top. No, really. Look. Why am I speaking Spanish? It’s because I think I know Spanish. Why do I think I know Spanish, and why am I crumbling at my computer? It’s because I’m addicted to the tv show,Velvet, a Spanish drama. Velvet is like Mad Men meets The Notebook meets The Paradise meets the total fulfillment of my heart. At first I was just looking for a new show. I wanted to see what Netflix had to offer. I bypassed The West Wing again–it’s been in my queue since the “Playlist” was called a “Queue”–and there it was. My beauty. My Velvet. Netflix told me I’d give it a full five stars, but I was skeptical. After all, Netflix thought I’d give My Father the Hero 3 1/2, and that movie is a solid 0-how-did-this-movie-get-made stars for me. And I’m the Katherine Heigl fan! But I took a chance. The show started, and it’s full of Castilian Spanish. I’m not a subtitles person, so I was just about to hit Back to Browse. And life will never be the same. Alberto and I had a connection immediately. Each episode pulled me more into the tragic and gripping story of Ana and Alberto, two people who just want to be together without ruining everything and everyone in their way. Is that too much to ask? Come on, Madrid department store investors and the entire Marquez family! So yeah, I was being totally normal. And then, halfway through Season One, when Alberto finally puts everything aside and decides to marry his love, Ana runs out of the church in her (gorgeous) lace wedding dress, and my world fell apart. ¡No, Ana! ¿Por qué, Ana? ¡Estúpido Ana! ¡Estúpido Velvet! ¿Por qué?????? It was kind of like the real life version of this awful high school video project I did. It put me in a real funk, guys. I didn’t want to watch more of the show. I didn’t want to be a part of a world where Ana and Alberto didn’t end up together. Cristina, you’re nice, BUT YOU’RE NOT HIS SOULMATE, SO BACK OFF RIGHT NOW. As this blog post shows, I’m so over it now. I mean, her dress was not even that pretty, okay. And Rita certainly isn’t funny, and I don’t identify with her at all. And that little paper airplane thing that Ana and Alberto do for each other is like so noooot cute. But actually it’s really cute. Okay, I’m still there, in the thick of it, trying not to go insane. Trying to take a little space to remind myself that I have a life outside of the Velvet department store and that I don’t live in the 1950s and that Spanish is not my native language. Am I insane? Yes. Yes. Okay. Immature and insane. And I know this, and part of me never wants to post something like this because it feels awfully close to my fifth grade diary. But you know what? This is real life sometimes. This is real life when I’m consumed by unreal life. I will not go into a hole this time. This time I will keep the crazy under slight control. I will take a break, and realize that there is a sun shining outside. Real life has its incredible moments (and its Alberto) too. I will know this truth… and then I will watch the rest of the season and see if Ana can possibly make this thing work because she HAS to for everyone’s sake. He’ll never be happy with Cristina, not in the same way. And what would Ana do? Be a seamstress forever? Never open her own store or live in Paris or be a designer? She can’t bear to leave him, so she’s just stuck watching him complain about being a tycoon while he makes a family with his investor’s daughter. Gah! ¡No, Ana! ¡No, Alberto! I don’t want to blow this out of proportion. I really don’t. I’m just casually putting it out there that if anyone sees an Ana/Alberto pillow on Etsy, don’t be afraid to send me the link… unless I’m the one making the pillow because that could be on the horizon. Some people have useful talents, like the ability to look natural walking in heels or applying lipstick without wondering exactly where the bottom lip ends. I have a useful talent as well. Some call it internet stalking; I call it embarrassment-feuled creeping. I’ve always had a tendency for obsession, so in the modern age where I can scour the internet looking for the ex-wife of a semi-famous novelist to figure out what went wrong, I do. And usually I don’t see much wrong with this. However, when I stumble on a piece of information (still in the public-sphere) that’s particularly juicy, I realize I may have taken things too far. Jill noticed that in the dedications of the first book, there was a woman’s name, a name that did not belong to the author’s wife. Jill was frantic, understandably so. She did a little preliminary research. No need to get us all up in arms if it was his wife’s nickname. It was wishful thinking. For the sake of the example, let’s say the book said “to Sophie” while the wife’s name is “Aishwarya.” There was just no way. BOOK #1 OF A TRILOGY IS FOR WIFE #1, AND BY BOOK #2, HE’S ON SOMEONE ELSE?!?! Jill let us know of this tragedy: “I feel like I just found out Mr. Darcy was married when he met Elizabeth.” I, of course, told her to take it back immediately because how dare she ever utter such blasphemy! And after I was finished partially recovering from the thought that Darcy was anything other than the socially-awkward hottie of every intelligent woman’s dreams, I began to creep. I took action. After some heavy research, like finding an art show in college where his then-girlfriend was a subject, I creeped on his ex-wife. I was relieved to find that she was in a relationship with another man, and according to Facebook, her father still “liked” the author’s first book. It was here that I realized I was in very deep and needed to pull out. I mean, it’s not like I’m engaging in illegal activity, but the fact that I have to make that clear indicates I went a bit too far. Maybe I’m good because I’m hyper-observant. Like, I’m really good at spotting celebrities, and even those who aren’t full-on celebrities. Please see Jill and I’s encounter with a Mad Men guest star, or know that just today I refrained from telling a man that I admired his work in Bride and Prejudice (because obviously I’ve memorized every person in every Austen adaptation ever). Just know that a P.I. career could be in my future. I have been watching a lot of Veronica Mars lately. Oh, and here’s a picture of my most recent fun purchase. 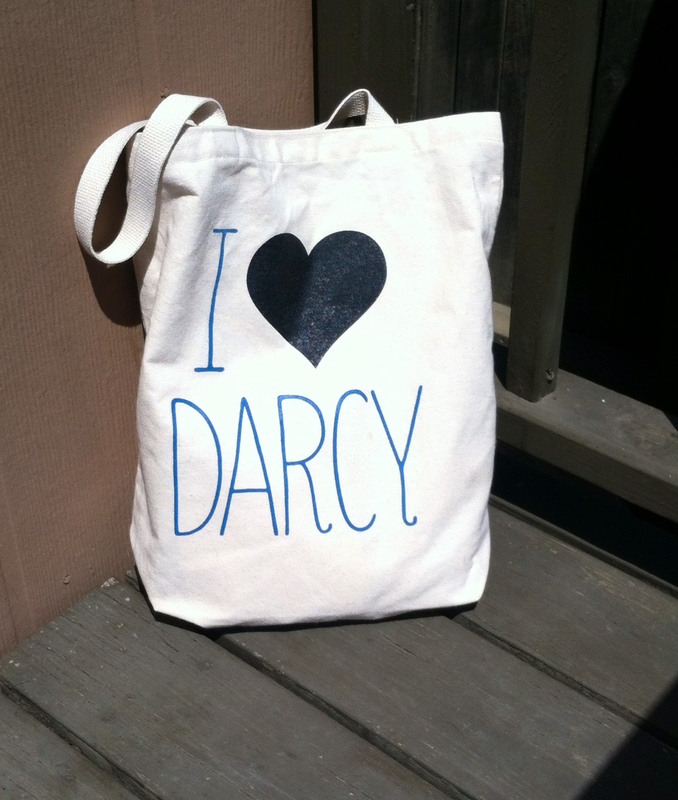 I feel it’s appropriate for this post with so much Darcy talk. One could see my life as a series of obsessions: times (varying from a week to several years) when a subject, movie, book, or show consumes me. One could also stop using “one” as a pronoun. One could try. There’s a fun read by Polly Shulman titled Enthusiasm that speaks to this sort of crazy, following a character as she discovers Jane Austen. I had a Jane Austen phase, too. I don’t know if “phase” is the right word. Phase implies an end. Once I’m obsessed with something it never really goes away. The pain is just lessened. The intense heartache I feel in the middle of an obsession is eventually replaced with a dull twang. There have been other author enthusiasms and other book obsessions. Boston Jane. A little series that made me like cherry pie, and I HATED cherries. Ella Enchanted. Ella and I both “frell” for Char. John Green could fall into this category as well, but it really all began with the vlogbrothers and not with his books. The land of Nerdfighteria is deep and fathomless, and I’m still a little in there. There have been movie enthusiasms. Mom says my very first obsession was with Wild Hearts Can’t Be Broken (or as I call it, “Diving Girl”), a movie about a girl who rides a horse into a pool. It inspired me to befriend my imaginary horse named “Wilburt with a ‘T. '” Obviously, this obsession ran over into the period of Anne of Green Gables enthusiasm. 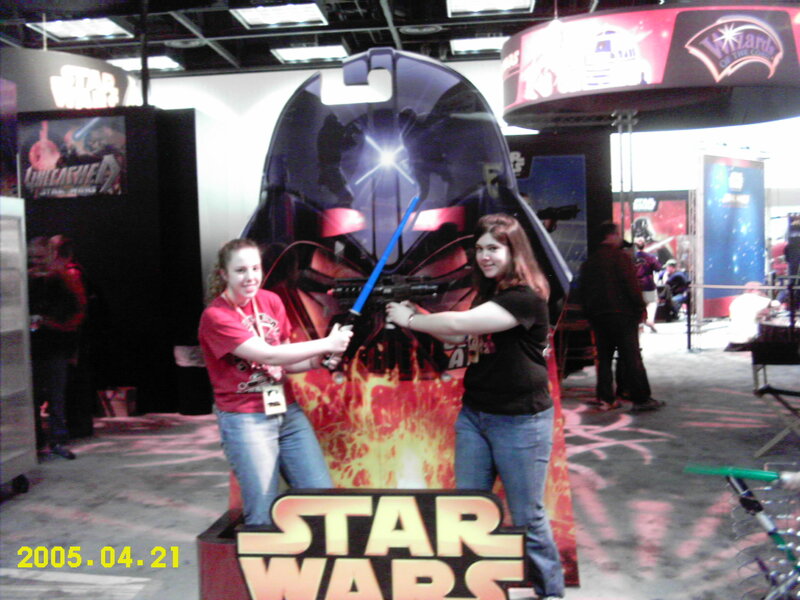 There was the Age of Star Wars, one of my longest obsessions, strongest from ages 8 to 14. Highlights of this obsession include: attendance at Star Wars Celebration, a Queen Amidala Halloween (or maybe two or three), and several Tatooine-themed sleepovers (with only myself). Does watching Mutliplicity at least once a day for several months count as an obsession? Add Multiplicity then. I’m not proud. There was the three months of watching every I Love Lucy episode multiple times. I read both Lucy and Desi’s autobiographies, watched several documentaries and miniseries about them, imagined living at Desilu Ranch, and cried several times over the couple’s failed marriage (and not over the fact that they are both deceased). I was 20. The Young and The Restless. I blame Mimi (my grandmother) for starting this, and I blame the Nick/Sharon breakup for ending it. There were the more odd obsessions. Presidential trivia. In my memory, it was a blast to utilize on family road trips (but I have a sneaky suspicion that I am the only one who remembers it that way). Crocheting. Two Christmases ago I made everyone in my family a scarf. I haven’t crocheted since. Kristen Wiig’s Target Lady, which just consisted of me using that voice and severely embarrassing myself at actual target check-out counters (because the cashiers didn’t watch SNL?). Fortunately, I’ve learned to simmer down my tendencies to go bat-crap crazy over something. I do things to protect myself. While reading Divergent over Thanksgiving break, I got pulled in hard, so I looked up the ending when I was halfway through the second book. I know, I know. It was sacrilege, but knowing the end meant I didn’t have to go all in. Going whole hog insane over something is a very selective process at this point in my life. There are farther stretches between obsessions, and when I do go there, I try to be very intentional about the amount of time I spend thinking about things like roast beef sandwiches. Because when one falls in love, one wants to really mean it (especially in the sandwich arena).